Just made an experiment how my new Galaxy Note 4 stands against my DSLR Canon 5d mark II. I zoomed 5d mark II with 16-35 f/2.8 II L equal to Note 4 horizontal FOV (what resulted in 29mm) then made several shots from the same point. 5dmk2 JPG+RAW (as I always shot). JPG: WB – auto, Picture style – standard, quality – normal, Aperture priority f/8, evaluate metering. 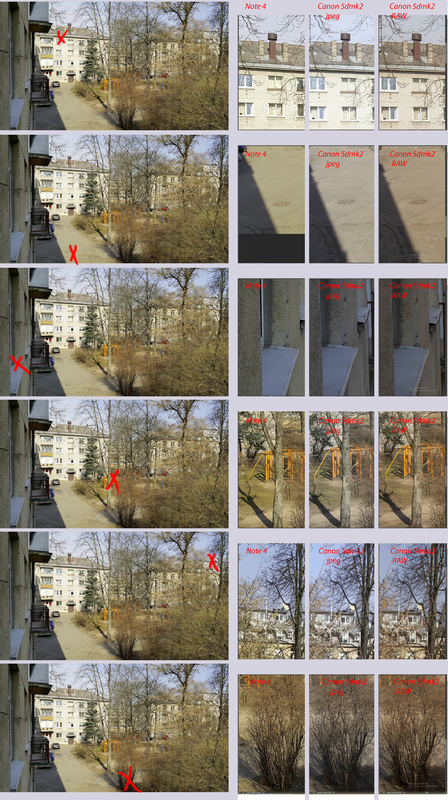 RAW: some standard tuning to my taste, shadows /highlights – additional sharpness CA removal. Good comparison. Can’t be long off before we arrive at a wedding/ job with just a mobile phone. Obviously the lenses will be the next hurdle for phone manufacturers. Very nice and interesting comparison ! I start to use iPhone 6 to make some of my advertising photos and I think it did very nice results. Do you know the Moment lenses ? Can you tell me if they are well done? Extremely useful info specially the final section I deal with such info much. I have both I phone 6 and Note4. Note 4 beats I phone with flying colors. Much better low light picture handling and much better video. Even in a day light it beats out competition by large margin. I also use D7000 Nikon and Jpeg is better on Note 4.